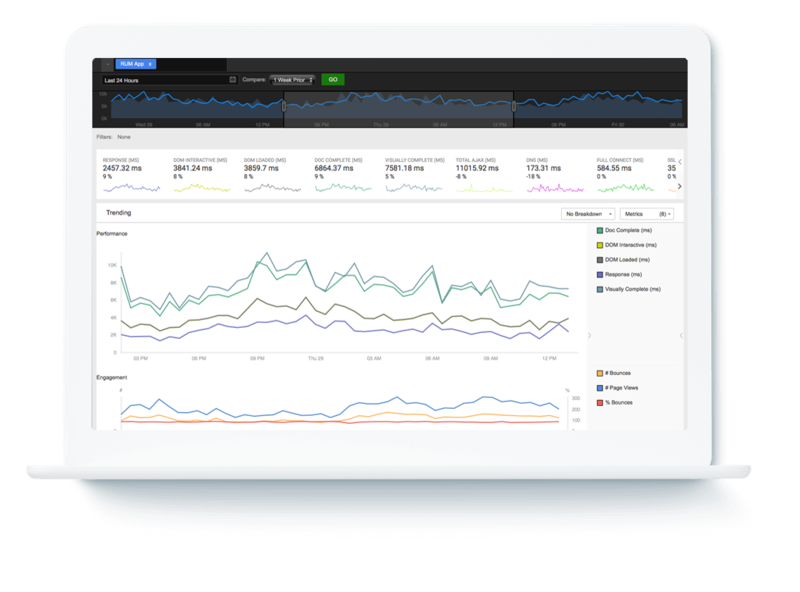 Detect, identify, escalate, and fix performance issues with over 20 unique synthetic monitoring test types from over 700 global monitoring nodes. 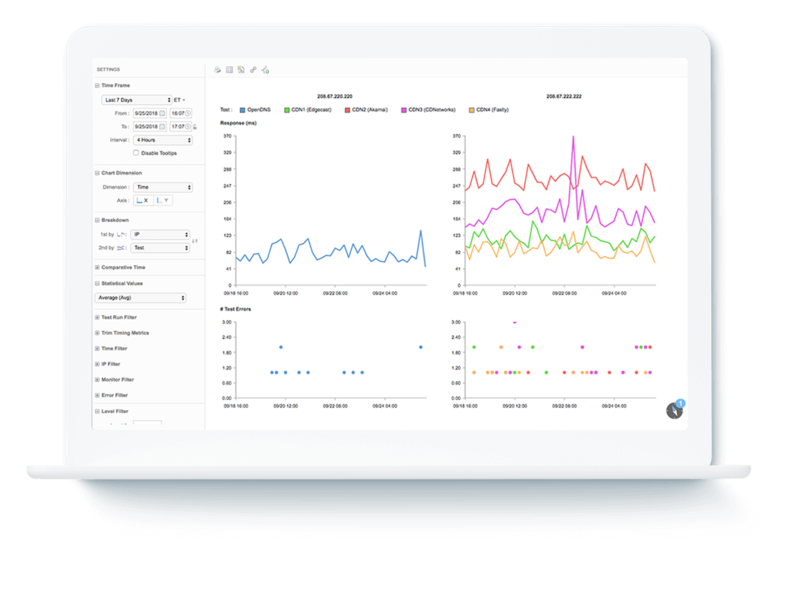 Monitor and troubleshoot all of the delivery chain with visibility into DNS, CDNs, local ISPs, APIs, third-party providers, and more. 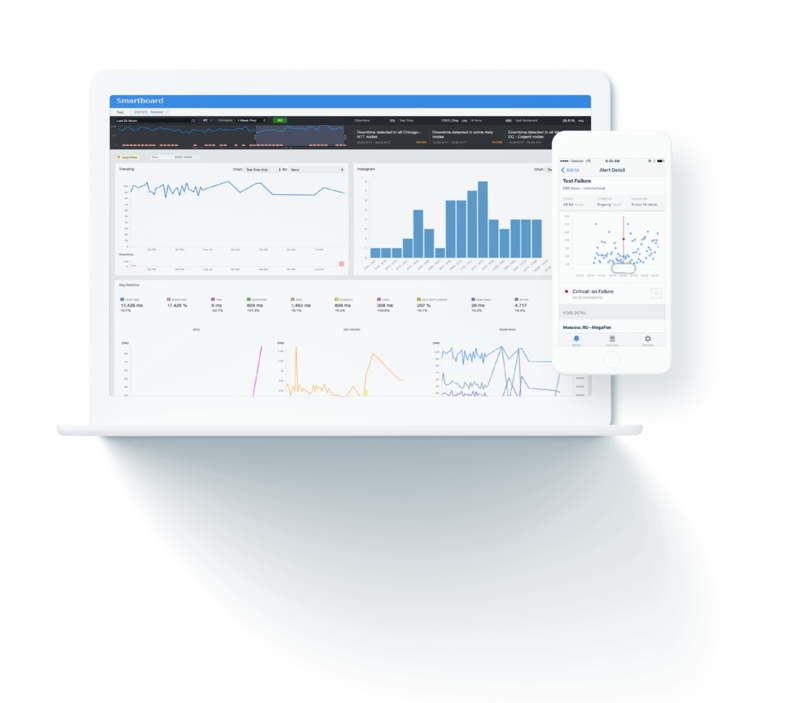 Measure your applications and services using the largest number of synthetic monitors spanning backbone, broadband, cloud, enterprise, last mile, and wireless nodes. See, understand, and explain what is happening with accurate alerts preempting issues before customers are impacted. Set advanced alerts with dynamic thresholds such as trend shifts and baseline deviations. Collect rich telemetry to rapidly identify failing components. Get troubleshooting guidance from extended debugging information with each alert. Perform multi-dimensional and historical analysis with the most comprehensive and actionable real-time intelligence to visualize performance, availability and reliability of your applications and services. Explore raw, un-aggregated data and analyze multiple dimensions to uncover performance and availability trends for deeper insights. Rely on an extensive set of straightforward visualizations or bring your own to get meaningful answers from our real-time data. Create reports or dashboards and share the insights with key stakeholders both inside and outside your organization. Focus your time and resources on issues that will improve your customer experience. Identify problematic pages and resources across networks, devices and browsers to continuously improve the end user experience. Correlate site performance to user engagement metrics to focus resources on areas providing the greatest benefit. Understand the effect changes have on the end user experience. 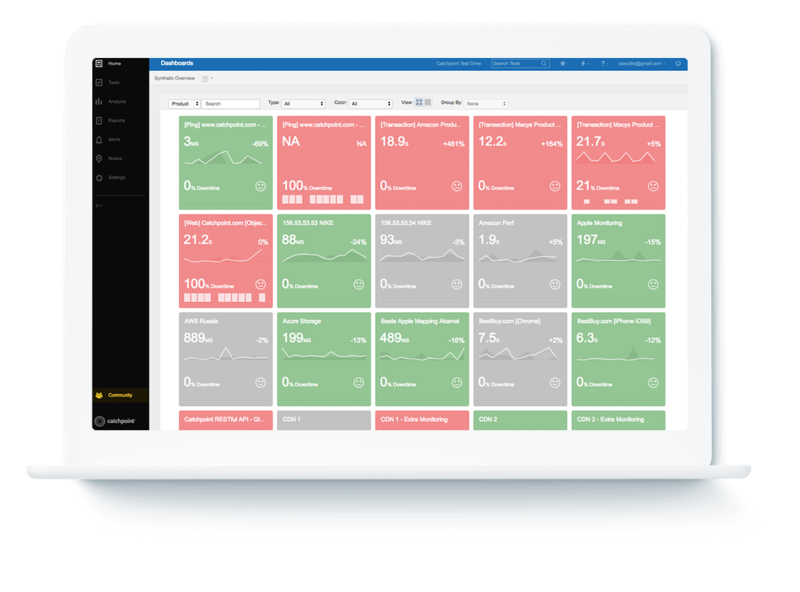 Correlate your user’s experience to business metrics with an accurate and true view of the customer’s experience. Correlate business KPIs with operational performance or model what-if scenarios to drive better business decision making. Make informed, data-driven decisions on where to invest in new infrastructure initiatives to reach new markets. Manage the performance of all external providers from CDNs to tag providers, and understand their impact on your customers. Monitor and measure your website utilizing Chrome or Internet Explorer. Run continous queries to recursively or directly measure your infrastructure. Use a scripting language to run API transactions and measure performance. Use Selenium script to monitor transactions with 1+ webpages and actions. Model communications over MQTT to monitor the performance of IoT applications. Connect to an SMTP or IMAP server to monitor a mail server, search, fetch, and send test emails. 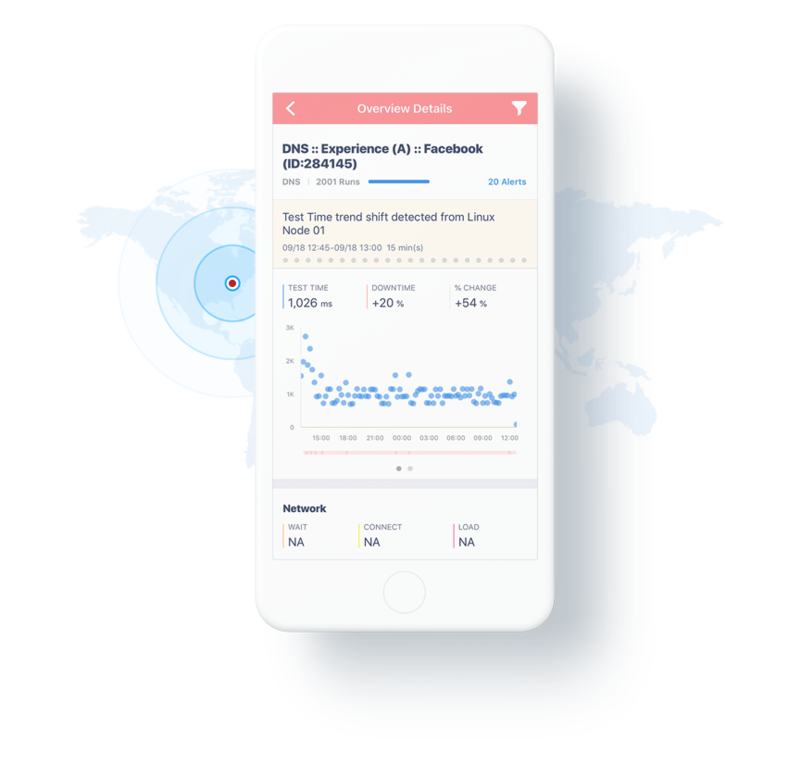 Monitor and measure your mobile site by loading 1+ mobile webpage actions. Measure request components, like buffering and bandwidth of a stream. Validate SSL certificates, perform certificate pinning, and alert on expiration. Load a snippet of HTML to measure the downloading and rendering of HTML. Monitor and measure the performance and availability of a remote FTP server. Monitor the performance and availability of HTTP services. Model communications over MQTT to monitor the performance of IoT devices. Model communication with a remote server over UDP and validate response data. Connecting to a host and port with the option to send request data. Model communications over a websocket connection. Monitor and measure the performance, availability, and functionality of any NTP server. Run ICMP, UDP, and TCP traceroutes to measure latency and packet loss. Run ICMP, UDP, and TCP pings to measure issues with a specific server. Check Signal Strength, Signal Quality, and other metrics related to WiFi. Run your own code on an Enterprise Node by creating a script to monitor the performances of your service using the programming language of your choice. Once the code is written, just upload it, schedule a test, and Catchpoint will execute your code, process the output data, and collect the metrics you defined. Use the ping utility to capture important information like latency, jitter, and MOS to determine the quality of your VoIP service. Check the performance of your database and correlate with application, network & infrastructure metrics. Correlate the performance / availability of your services with how your customers feel about you on Twitter. See how performance impacts the scores provided by Google Lighthouse over time. Get a clean view of performance by measuring digital services externally from datacenter-neutral facilities on tier 1 providers like Level3 or Cogent for Backbone, Comcast, or British Telecom for Broadband. 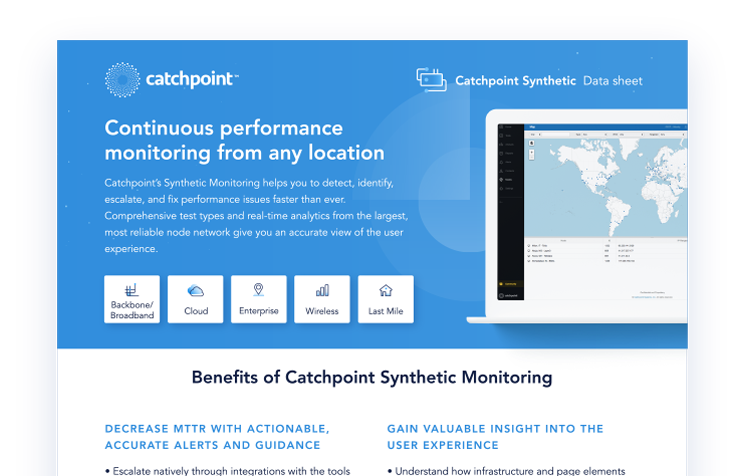 If you are looking at first mile testing or functional testing of cloud-based services from within the cloud, then the Catchpoint Cloud Nodes provide you with the data you need. Test from consumer ISPs for an accurate view of performance from the last mile. Last Mile Nodes are hosted in major geographies, across multiple last mile providers, on dedicated devices. Gain visibility into mobile end user experience from synthetic tests run from multiple, worldwide cellular networks like AT&T, Sprint, T-Mobile, Verizon, Vodafone, Telefonica, or China Mobile. Our comprehensive node types and extensive testing network eliminates blindspots and deliver the insights you need to understand the end users experience across the globe and to identify and resolve issues quickly. Data this good can’t be tied down. Learn how to get more out of your synthetic data.